Quakers have tended to assume that their movement is somewhat atypical and unique within Christianity. In his Journal, George Fox gives the impression that his understandings were entirely the result of divine revelation and that the emergence of the Quaker movement represented the end of the long apostasy of the church that began shortly after the death of the apostles at the end of the first century. However, the evidence suggests that pretty much all the so-called ‘peculiarities’ of Quaker theology, spirituality and practice can be found in other groups and movements within Christian history. In particular, the spiritualist wing of the Anabaptist movement that emerged in Europe during the ‘Radical Reformation’ came to a set of almost identical views as those of early Friends. The individuals and groups associated with the Radical Reformation rejected both the beliefs of the Catholic Church and those of the Magisterial Reformers such as Luther, Zwingli and Calvin (see Williams, 2000). McLaughlin has argued that “the Reformation as a whole ‘spiritualised’ much of Medieval Catholicism. As a result, all of the Reformers were ‘spiritualists’ to one degree or another” (McLaughlin 2007, p.119). The Reformers rejected the spiritual power of the outward sacraments and the mediatory function of the priesthood (sarcedotalism). The Spiritualists agreed with these positions but in turn rejected the Reformer’s assertion of ‘sola scriptura’ (the Bible as primary religious authority) and ‘sola fide’ (justification by faith alone) which had the effect of disconnecting the believer’s life and works from the process of salvation (McLaughlin 2007, pp.119-120). The theology and spirituality present in the writings of Hans Denck provide a good example of this ‘spiritualising’ tendency and one that has real resonances with the early Quaker vision, even though they predate the emergence of the Quaker movement by some 125 years. B. Who was Hans Denck? Hans Denck (1495-1527) was a German theologian and Anabaptist leader during the Reformation. Denck was born in 1495 in the Bavarian town of Habach. After a classical education, he became headmaster at the St. Sebaldus School in Nuremberg in 1523. It was here that he met Thomas Münzer, and first came in contact with Anabaptism, which he accepted on his own terms. As a result of his Anabaptist convictions, he was banished from Nuremberg in January 1524, and forced into an itinerant life until his death. Following a long period of travelling in Southern Germany and Switzerland he found refuge in Basel. After attending the Martyrs' Synod in Augsburg, he returned to Basel where he died of bubonic plague in 1527. Denck’s religious ideas were adopted and developed by a number of his followers including Johannes Bunderlin (1499-1533) and Christian Entfelder. Although the spiritualist stream of Anabaptism quickly disappeared from view and died out, Denck’s writings and ideas have continued to have an influence on the Anabaptist tradition. A belief that the corruption of the church began after the death of the apostles when people began to focus again on outward things and human authority rather than on Christ’s spiritual leadership of believers and the church. That Christ rather than the Bible is the Word of God and that salvation is not bound to scripture (scripture is a witness to the workings of the Word of God). The Spirit leads people into unity whereas the Letter tends to create disagreement and division. Christ’s historical sacrifice in the flesh is not all-sufficient for salvation since what is also required is an inward crucifixion and resurrection within the individual through the active power of the Spirit of Christ. Outward baptism with water is not required because the sacrament is primarily an inward spiritual baptism by the Holy Spirit. The outward Lord’s Supper is not required since the sacrament is primarily an inward and spiritual feeding on the spiritual body of Christ who is the ‘bread of life’. A commitment to nonviolence, religious toleration and freedom of conscience. A rejection of oaths and ‘false swearing’. A rejection of the doctrine of predestination. That they were reintroducing a form of works righteousness (and so were accused of being ‘Catholics in disguise’ and of promoting ‘monkish holiness’). That they were ignoring the historical Jesus and denigrating the efficacy of his sacrifice on the cross. That they were denigrating the importance and value of the Bible. That they were failing to follow Christ’s ordinances (water baptism and Lord’s Supper). 1. The New Covenant – Christ has brought a new covenant which is inward and spiritual and in which the Holy Spirit writes God’s law on people’s hearts. Whoever has received God’s new covenant, that is, whoever has had the law written into his heart by the Holy Spirit is truly righteous. Whoever thinks that he can observe the law by means of the Book ascribes to the dead letter what belongs to the living Spirit. Whoever does not have the Spirit and imagines that he will find him in scripture looks for light and finds darkness, looks for life and finds only death, not only in the Old Testament but also in the New…. Whoever has really laid hold of truth can assess it without Scripture. 2. Inward Christ, Outward Transformation - We come to God through Christ but in order to do this we must first experience Christ working within us and transforming us so that we come to follow his way and life outwardly. But the medium is Christ whom no one can truly know unless he follow him in his life, and no one may follow him unless he has first known him. Whoever does not know him does not have him and without him he cannot come to the Father. But whoever knows him and does not witness to him by his life will be judged by him… Woes to him who looks elsewhere than to this goal. For whoever thinks he belongs to Christ must walk the way that Christ walked. 3. Baptised in the Spirit, Taught by Christ - In the new covenant the believer experiences a baptism in the Holy Spirit and is taught directly and inwardly by Christ who is the Word of God. The scriptures are not the Word of God and can only be understood when read in the Spirit that gave them forth. All commandments, customs and laws insofar as they are written in the Old and New Testaments are suspended for the true disciples of Christ since he has a word written in his heart, that is that he loves God alone. By this he orders everything that he does even if he has nothing written. If there is a part in the whole that he cannot understand he does not despise the witness of scripture but he searches diligently and compares them with each other. But he does not accept the scripture before it has been interpreted for him through the anointing of the Spirit. When he does not understand he suspends his judgment and waits for God’s revelation. For a belief or a judgment that has not been revealed by the key of David may not be accepted without great error. 4. The Spirit and the Letter - Christ is the Word of God not the scriptures. The scriptures do not have the power to bring people to salvation, only the power of the living Spirit of Christ can do this working within them. I value the Holy Scriptures above all human treasures but not as high as the Word of God, which is living, powerful and eternal, and which is free and unencumbered by all of the elements of this world. For, insofar as it is God himself it is spirit and no letter, written without pen and paper that it may never be expunged. Therefore also salvation cannot be tied to the scriptures, however important and good they may be with respect to it. The cause is that it is not possible for the Scriptures to improve and evil heart even if it is highly learned. A pious heart, however, that is a heart in which there is a true spark of godly zeal, will be improved through all things. 5. Inward Lord’s Supper - The Lord’s Supper is not an outward meal but rather an inward and spiritual feeding on Christ who is the bread of life. The Lord Christ took the bread in the supper, blessed it and broke it. This was as if he meant to say: I have told you before that you should eat my flesh and drink my blood if you wish to be saved and indicated that this was to be done in a spiritual sense and not as flesh and blood understand it. Now I am emphasizing the same thing again here, how you ought to regard his bread and wine. For as this bread is the support of the physical life of your souls through the power of God as it is given, chewed and spiritually eaten, that is, as it is known and believed. Again as this wine makes the heart of man fresh and glad, so also my blood which in the love of God I shed for you. If you so regard it, it will refresh you, make you joyful and fervent in love, so that you become completely one with me, and that I remain in you and you remain in me even as the food and drink are united with the nature of man. 6. Real Transformation not Salvation in Sin - The idea that people are saved in sin is a blasphemy and a denial of the presence of Christ who’s Spirit has the power to transform us and free us from sin in this life. 7. A Peaceable People - True followers of Christ do what he commands. They do not use outward violence or coercion because their weapons are inward and spiritual. Therefore discipline within the Christian community should be based on Christ’s teaching in Matthew 18:15-20. 8. Christians and the State - In the fallen world, the state has the power to control evil by force. However, through the work of the Spirit, Christians know a better way and so cannot play a part in the violent and coercive action of government. Our first loyalty is to Christ rather than the state. 9. Religious Toleration - As followers of the way of Christ we believe that there should be no coercion in matters of faith. We should practice toleration of different beliefs and freedom of conscience. Such a security will exist also in outward things, with practice of the true gospel that each will let the other move and dwell in peace — be he Turk or heathen, believing what he will — through and in his land, not submitting to a magistrate in matters of faith. Is there anything more to be desired? I stand fast on what the prophet says here. Everyone among all peoples may move around in the name of his God. That is to say, no one shall deprive another — whether heathen or Jew or Christian — but rather allow everyone to move in all territories in the name of his God. So may we benefit in the peace which God gives. Church Order and Discipline – Denck does not appear to have given much attention to ecclesiology, maybe because during his life he had little involvement in establishing and ordering Christian community. Early Quakers however were quick to establish organisational structures, to nurture of cohesive community and to implement forms of discipline and mutual accountability. Visible Public Witness – Because they gave absolute priority to an inward spirituality, over time the Spiritualist Anabaptists tended to become religious individualists who operated secretly and therefore invisibly. Quakers however maintained a strong commitment to public witness even in the face of severe persecution and saw themselves as a visible people of God rather than as isolated individuals. Dualism – The Spiritualists often adopted a dualist position based on the philosophy of Plato in which an absolute and fundamental distinction is made between the spiritual realm and the physical realm. This often led to the kind of invisible individualism mentioned above. Quakers on the other hand rejected dualism and believed that inward spiritual transformation would always be reflected in a visibly changed physical life. For them, one of the most significant aspects of the incarnation was that in the coming of Christ heaven and earth, spirit and matter had been united and that therefore this was now to be the way for humans and the whole of creation through the work of the Spirit of Christ. 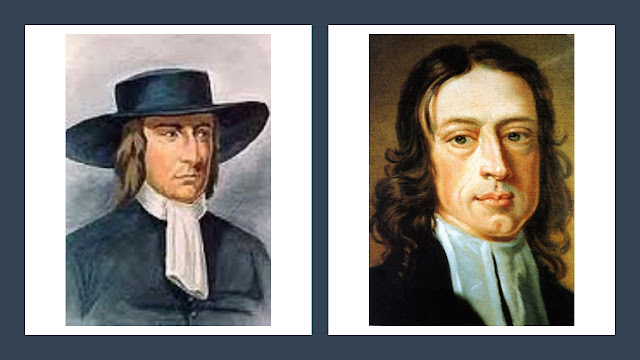 In conclusion therefore, what we see in the emergence of the Quaker movement in 17th century England is a Christian tradition that is located firmly in the theology, spirituality and practice of the 16th century European Radical Reformation. Friends combined the Christology and soteriology of the Spiritualists with the ordered and disciplined ecclesiology and public witness of the more Biblical Anabaptists such as the Swiss Brethren/Mennonites and the Hutterites. This is all great stuff. I am particularly fond of Denck's 'I value the Scriptures... but not so highly as the Word of God' statement - this is one of the central reasons I don't identify as an evangelical (even though I love the Bible and have been writing Bible notes for 30 years). However I disagree on the sacraments: for me baptism and communion affirm the value of the body and the significance of the Incarnation, and focus the general holiness of creation. I know God is a Jewish mother because she expresses her love for us by feeding us! Thanks Veronica! It is ironic that the rejection of outward sacraments on the basis that they cause division between Christians just caused further division. From my point of view, if Quakers believe that it is possible for God's grace to be received in all places, in all time and in all activities, then it must also be possible for this to occur in water baptism and the Lord's Supper. As you will have seen in my last post on 'Celestial Flesh' I am concerned that a dualistic spiritualism can lead to a negative and dismissive attitude towards God's good creation and to a neglect of bodily expression. I found Arnold Snyder's nuanced explanation of the significance of water baptism and the Lord's Supper within Anabaptist spirituality very helpful. Of course he does confirm that the spiritual baptism is primary.